Infrared Hair Straighteners Promise Silkier Locks—But Do They Work? The secret to healthy, shiny locks. One week in, and Insta-famous makeup artist Katie Jane Hughes swears by it, and online reviewers are abuzz with its ease and results. We’re talking about straightening hairbrushes but specifically about one newly updated tool, in particular, which has a high-tech, time-saving, and shiny hair–imparting secret. 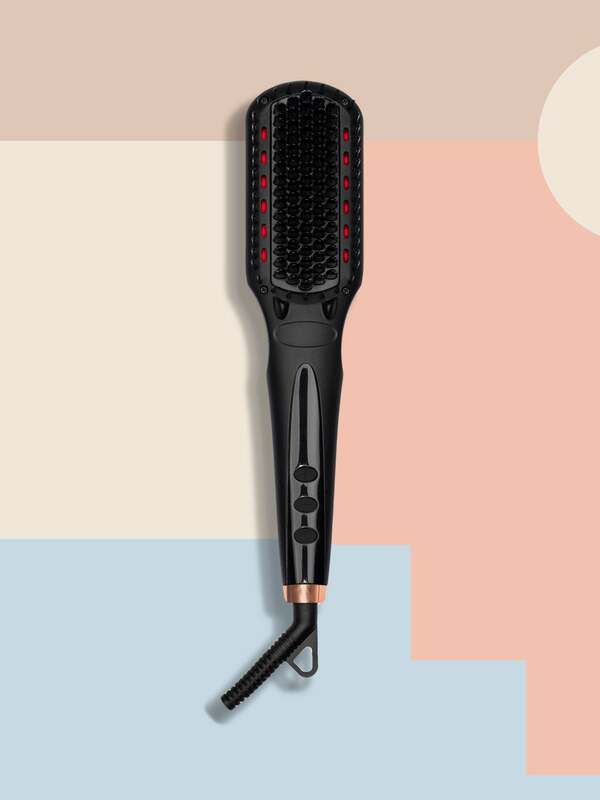 The Brooklyn-based haircare and tool brand Amika has just released the 2.0 version of its best-selling Straightening Brush, and it has a superpower. Straightening brushes gained popularity in the ’80s and ’90s for melding two tools into one to save time and effort. They fell out of fashion, but—like all things ’90s—are making a strong comeback, thanks in part to how much better they are for your locks compared to traditional hair straighteners. Amika’s Polished Perfection Straightening Brush was part of that resurgence, with the original launching in 2017 and quickly gaining a cult following. Fusing the power of a straightener with the ease of a hairbrush, this do-it-all tool straightens even the curliest of curls with just a simple swipe or two. But it’s the brand’s new Polished Perfection Straightening Brush 2.0 that’s interesting to even non–straightening brush users. Featuring iRed beam technology, the tool can brush through hair even quicker, with smoother results. It may sound too good to be true, so here’s the science: The tool uses far infrared heat, which can permeate the hair shaft deeper for an instantly smoother and silkier look. (The form of heat used in popular infrared saunas, like Higher Dose.) The far infrared light beam strips run along the sides of the brush’s base to allow the heat to go deeper into the hair and retain maximum moisture with less damage. The brush is also designed to work faster than any straightening tool in your arsenal. We wanted to see for ourselves what all the hoopla was about. Domino’s senior home editor Gabby Savoie gave it a test run for a few weeks and was impressed by the results. “As someone with very fine, unkempt, wavy, and extremely frizzy hair, my morning routine usually involves at least 15 minutes of fixing flyaways—low maintenance, I know,” says Savoie. Her normal routine includes washing and conditioning, blow drying, straightening, and then curling—a process that can take an hour or more when done every few days. Presented with the idea of time-saving, Savoie jumped on board. She first tested out the brush on a weekend getaway in lieu of her usual blow-dryer, straightener, and curling iron combo. She dried her locks with the hotel hair dryer and then used the Amika tool. “I was very pleasantly surprised at how quick and easy it was to make my hair look presentable,” she said. Even more so than “presentable,” Savoie received a few compliments regarding the shininess of her hair. “For the record, no one has ever described my hair as shiny before,” she says. Shininess aside, Savoie noticed a considerable difference in the tool being less damaging to her hair than a traditional straighter. That said, humidity got the best of her locks, which finally led her to admit that the Polished Perfection Straightening Brush doesn’t keep hair as straight as a traditional straightener, and it was a bit trickier to maneuver around tresses when using. “For now, it’s more of a time-saving tool than a life-changing blowout replacement,” says Savoie. If your interest in straightening brushes is piqued, there are a few more on the market that users love. Drybar Brush Crush Heated Straightening Brush ($145) is a powerhouse of a tool. It heats up to 450 degrees, so it’s closer to the temperature and sleek-staying results of traditional straighteners but is much simpler to use. If you’re looking to just dip your toe into the straightening brush market, grab the cost-conscious Revlon XL Hair Straightening Heated Styling Brush ($39). The price is hard to beat, and the ionic technology imparts a smooth, sleek finish.